I Can’t Believe it, Myself. I learned to crochet. It wasn’t pretty for a moment there, when I sat down with the pattern and thought “Ooh, I just wasted $5.50, because I do not understand this AT ALL.” I got back up and printed line by line instructions for each of the stitches needed and went for it. Why didn’t anyone tell me how fast crochet is? I can’t believe it! Two evenings of lazy crocheting and general farting around, chatting and watching movies and there’s a scarf. I want to make a bunch of these now and have some fiber set aside to spin up a yarn with long color shifts for the next. Here’s the yarn and the fiber from this one. The scarf is Anne, by M.K. Carroll. Ravel it. Yarn School is REALLY SOON! There are still a few spots left, if you’d like to come. Sign-ups end tomorrow. To everyone coming, I can’t wait to see you! Any orders placed between the 18th and 29th will ship when I return. In case anyone was wondering, yeah, I didn’t quite manage the shop update before Yarn School. I dyed some Fat Sock, though, and I’ll get some more stuff done and ready for sale when I return because seriously, it has been so amazingly long since I dyed sock yarn! It’s pitiful, especially since it’s my favorite. Another head on the yarn monster. Beautiful! I’ve recently rediscovered crochet myself. I figured if I could do it as a kid, I could learn to do it now. I’ve been making dishcloths right and left, gearing up for a granny square afghan out of handspun. very impressive for a first time ! lovely colors – good job. I’ve been thinking about making Anne in a multi colored yarn, too, but I wondered if it would be a good combination! Now I get to see that it’s fabulous that way. Thank you. I know I was snarky on flickr, but this is really beautiful. Who knew?!?! Will you be bringing wares to sell at Yarn School? I sure hope so! Good job! PS The yarn is beautiful! that scarf looks like a party burst out! so fun! I’m just learning to crochet myself and I’m already really excited about it. Your beautiful project is giving me the inspiration I need to keep going. I want one just like yours! congrats – that’s a beautiful scarf! Did you ever ask about crochet?no? um well, I’ll tell you now then. Crochet is fast. It also tends to eat more yarn than knitting. Shhhhh! You’re not supposed to let the secret out! What was it Yarn Harlot said? Oh yes: Speed kills. You’ll have to be very careful now. Yarn School. Sob. I loved it so. Looks great. I’ve long wondered what your yarn would look like crocheted. Now you’re ready for Monica Brown’s Cropped cardigan. It’s super fast and easy. I love it! It’s such an explosion of color! I really need to get over my crochet fear. It must be in the air or something, because I have the bug to learn crochet. I was just telling my mom yesterday about it. There is a ripple afghan on flickr that I’m in love with. Mom said to just show her the picture and she could teach me how. I feel all fumbly though when I hold a hook. Weird. Knit lace on size 0 needles? No problem. Worsted yarn on a size G hook = mess. That scarf looks so much better in handspun! I might have to bring my hook out of retirement. yes it is great to crochet and awfully easy mostly. i did crochet lots of sweaters in my time and some of them looked exactly like brioche stitch. but it is yarn consuming and holding the gauge is much more difficult than when knitting. i started out a 9 with crocheting but it really is knitting is just so much more rewarding to me. gorgeous. 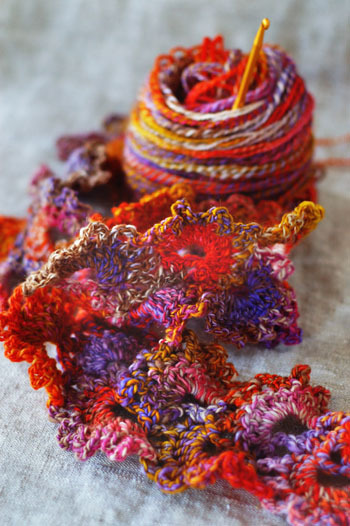 who knew crochet could look so fabulous? must be the yarn you used! Wow. Gorgeous. And I’ve previously avoided crochet like the plague. Everything looks better in Hello Yarn! Beautiful scarf! I love the colors. congrats on learning how to crochet! as far as i’m concerned, your not really stitching up to your full potential until you know how to knit and crochet. I’m glad the pattern worked out for you! It’s a traditional lace that, as you discovered, is not hard to do once the instructions become clear – I ran the pattern by several pattern testers before publication in an attempt to get it as clear as possible. I may get the chart redone to be larger, and with arrows to show the direction the stitches are worked in. Good idea? Love the way it looks in your handspun! I recently fell back in love with crochet when I went to the Japanese bookstore at Bryant Park, NYC and went through their craft section. Everything is in Japanese but the pictures and charts are the clearest I have seen and the lace is really cool and modern. If you are in NY you should check it out! I spent 70 bucks in just 10 minutes there! That looks gorgeous. Awesome job. that yarn is fantastic, and your did a super-duper great job crocheting! it is soooo much fun to learn a new skill isn’t it? especially when that skill involves yarn! Wow. The colors are gorgeous!